Asian hesperornithiforms are extremely rare in contrast to the much more abundant record from North America. In Asia, these fossil birds are only known from fragmentary materials from Mongolia. Here we describe the skeletal remains of a new hesperornithiform Chupkaornis keraorum gen. et sp. nov. from the Upper Cretaceous Kashima Formation (Coniacian to Santonian) of the Yezo Group in Mikasa City, Hokkaido, Japan. 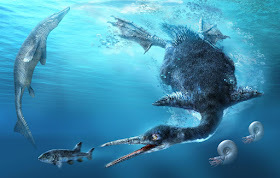 This is the best-preserved hesperornithiform material from Asia and it is the first report of hesperornithiforms from the eastern margin of the Eurasian continent. Chupkaornis has a unique combination of characters: finger-like projected tibiofibular crest of femur, deep, emarginated lateral excavation with a sharply defined edge of the ventral margin of the thoracic vertebrae, and the heterocoelous articular surface of the thoracic vertebrae. Our new phylogenetic analysis revises the phylogenetic relationships of Hesperornithiformes. In contrast to previous studies, Enaliornis is assigned as the most basal taxon and Baptornis is positioned as more derived than Brodavis. Chupkaornis is a sister taxon to the clade of Brodavis and higher taxa. Parahesperornis and Hesperornis are positioned within Hesperornithidae, the derived Hesperornithiformes. Many of the skeletal character changes are concentrated at the base of Hesperornithidae (Parahesperornis and more derived taxa), and involve the modification of the pelvic girdle and hind limb morphology (e.g. dorsal directed antitrochanter of pelvis, short and sprawled femur, including probable lobe-toed feet suggested by the specialized distal articular surface of first digit of fourth toe, and predominantly robust digit IV phalanges). These skeletal modifications are likely adaptations for foot-propelled diving behaviour. 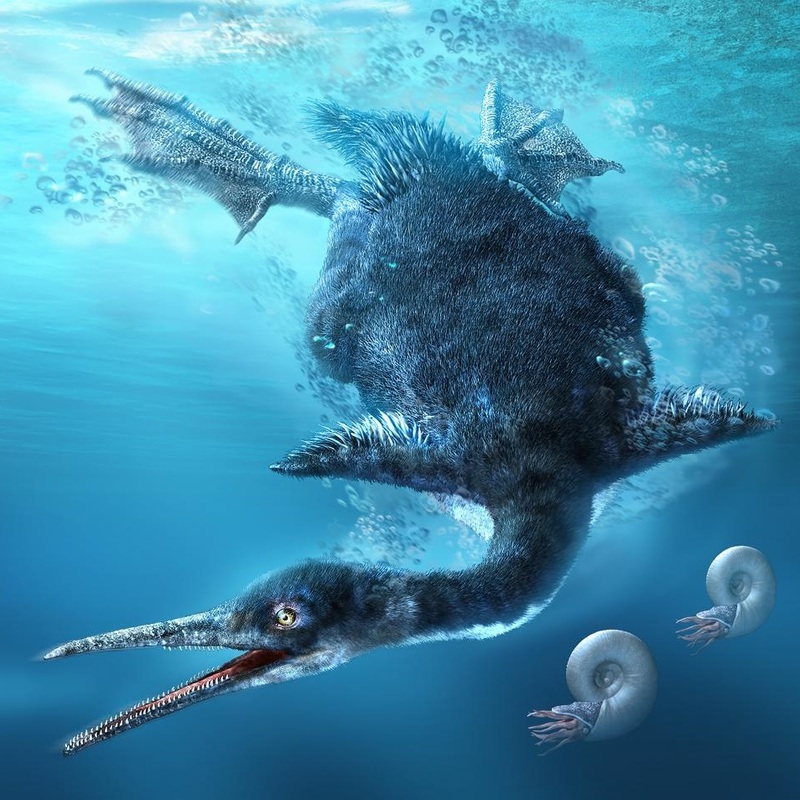 Japan's first and oldest fossil diving bird, Chupkaornis keraorum. Etymology. Chupkaornis, from the combination of the Ainu word ‘chupka’, meaning ‘eastern’, and the Greek ‘ornis’ for bird. Etymology. Named after Masatoshi and Yasuji Kera, who discovered the specimen and contributed greatly to the Mikasa City Museum. Holotype. MCM.A773; a partial skeleton of a single individual including four cervical and two thoracic vertebrae, the distal ends of the left and right femora, and the middle part of the right fibula. Locality and age. Kumaoi Creek, one branch off Lake Katsurazawa, Mikasa City, Hokkaido, Japan; Kashima Formation (Coniacian to Santonian), Upper Cretaceous Yezo Group. A new hesperornithiform, Chupkaornis keraorum gen. et sp. nov. (MCM.A773) from the Late Cretaceous of Japan, is the first record of the group from the eastern margin of the Eurasian continent and the oldest record for this avian group from Asia. The new material is the best-preserved Asian hesperornithiform specimen recovered thus far, and provides new palaeobiogeographical insights for the broad taxonomic group as well as significant new anatomical data. Chupkaornis keraorum is diagnosed by a unique combination of characters from thoracic vertebrae and femur. A phylogenetic analysis suggests that C. keraorum is a basal hesperornithiform. The new taxon is more derived than Pasquiaornis and more basal than Brodavis. The present analysis also suggests new phylogenetic relationships within the Hesperornithiformes; Enaliornis is the most basal hesperornithiform, and Baptornis advenus is a more derived taxon than Brodavis. The evolutionary rate calculation indicates that the rate of change is much higher within basal members of the Hesperornithidae compared to later branches. This rate change suggests that the most important morphological changes for highly foot-propelled diving adaptation are concentrated at the base of the Hesperornithidae.